I'm trying to make this Angel Food Candy, there only 4 ingredients - 1 cup sugar, 1 cup dark molasses, 1 Tbs. vinegar, and 1 Tbs. baking soda. I cook until at hard crack stage then add the baking soda. If I wait too long to put in pan it puffs up in the baking pot and won't rise in the pan. Angel Food Candy is really delicious. But, you're right. You do need to be pretty quick pouring it into the buttered baking pan. For those interested in making some of this honeycomb type candy, here's the complete recipe with the added benefit of a chocolate coating. Butter a 9x13 inch baking dish and set aside. Combine sugar, corn syrup and vinegar in a medium saucepan. Cook over medium heat, stirring constantly until sugar dissolves. Continue heating, without stirring, until temperature reaches 300 to 310 degrees F (149 to 154 degrees C), or until a small amount of syrup dropped into cold water forms hard, brittle threads. Remove from heat and stir in baking soda. Pour into buttered pan; do not spread. The mixture will not fill pan, but it will spread some naturally by itself. Allow the candy to cool completely before breaking into pieces. Melt your chosen chocolate over a double boiler or in the microwave. Stir well, and be careful not to overheat. 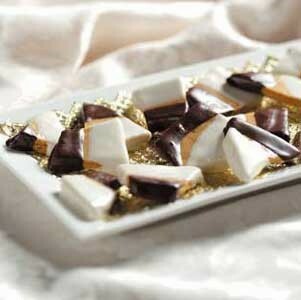 You may want to melt two types of chocolate to give it an even more elegant look as in the photo above. Dip the bite-sized pieces into the melted chocolate and place them on a waxed paper lined tray to set. Store in an airtight container. I guess the secret to this honeycomb candy is not to over handle it once you stir in the baking soda and pour out the mixture. I must warn you, though, it can be very addictive! Gosh, sorry you had that problem. I have never had that problem, so I cannot offer any suggestions. I just stir it in really really fast. There are dark spots throughout my angel food candy. They tasted bitter like baking soda. I sifted the baking soda and carefully sprinkled it evenly over the top of the liquid mixture. I quickly stirred it in being careful not to overmix, but I am wondering if I didn't mix enough? How long do I have to mix in the baking soda before I ruin the candy and it falls flat? Has anyone ever encountered the problem of the dark spots and did you find a way to fix it? This candy takes so much time to reach the temperature and then to have it not turn out is so disappointing. Here are some tips I have learned on making angel food candy. To cool the candy, pour it into a buttered metal pan and put into a warm oven, about 200. Shut off the heat and let it cool slowly. Cooling too rapidly will make it fall. When cool tip it over on waxed paper and twist the pan to pop out the candy. To help breaking it up, carefully score the back side deeply with a sharp knife, then break along the lines. Barometric pressure does affect candy making because it affects the temperature at which your candy will reach boiling point. That's why people who live at higher elevations (more pressure) have to test their candy thermometers to find out at what point water boils before adjusting their boiled candy recipes. To be honest, I'm not completely sure how the barometric pressure will effect the density of your angel food candy apart from that consideration. I, too, will be interested in hearing your findings. I do know that humidity will cause you the most trouble when making candy. The moisture in the air causes the sugars to misbehave when cooling. That's why so many people end up with "sticky" candy! :) You'll get much better results with low humidity (around 35% or less). Can't wait to hear all about your project. I hope you'll do a write-up about it (maybe even some photos if you can manage it) and we'll make a special page here on the site devoted to your experiment! for eighth grade science fair i am testing how barometric pressure affects Angel food candy's density or turn out. Do you know anything on how barometric pressure affects its turn out? I don't know if High barometric pressure or low barometric makes it hard. got any ideas? My recipe calls for the clear Kara and it is great!!! My husband is addicted! My most recent batch also stuck like cement, so I found this site looking for help and found it............THANKS for the buttered foil tip. Also, since I couldn't stand the thought of wasting all the cemented candy, I chisled it out and mixed it with melted chocolate. I called it "Angel Dust Candy"!!! It was a huge hit and tastes the same. So stop soaking the leftovers! between it falling in the pan and setting up better. My concern is how long to boil also. seem to have on the edges of the candy...even using the fresh baking soda. Anyone out there know how to get more honeycomb? I haven't seen a for sure answer yet. I wish I had enought nerve to try this in the microwave. Here in Buffalo we call it Sponge candy...we use dark Karo syrup not molasses, along with the vinegar and baking soda. I attempted my first last year- which came out great- except for either really big pieces or really small pieces. Does anyone have suggestions? There are those brownie pans out there that have the dividers- but they seem too large of pieces- I thought of ice cube trays- but I'm afraid it won't rise and the heat would be too much for plastic. Any suggestions? I found by the time you cover with chocolate- you have a pretty big piece of candy. How do the candy shops get them so even? Are there molds? I hae had that happen to me... once. For me, the reason was that after reaching a boil, I didn't turn the heat down. This stuff goes flammable in a moment! You heat was too high in the end. I see recipes with and with out vinegar. What does it do for the angel food? ...must have invented this stuff! I've been looking for this recipe every since I left Wisconsin! I grew up in New London, born in Appleton, and no one ever knew what I was talking about if they weren't from WI. And yes, the lower humidity is better. FL has so few days with low humidity. Thanks for all the excellent comments. I only have light corn syrup but have brown sugar. Can I substitute brown sugar for white sugar in the recipe? On another page Rhonda offered this tip for making angel food candy (sponge candy). I wanted to add it here so that more people can be helped. Rhonda suggested that after make your candy and pour it on the tray, pop it into an oven preheated to 225 degrees for 10 minutes and then lower the temperature to 170 and bake for another 10 minutes. Rhonda said that this makes the candy stay nice and puffy and delicious. If anyone else has tips for making angel food candy successfully, please be sure to add them. Line 8 x 8 pan with buttered foil. In microwave, cook sugar, karo and vinegar on HIGH for 3 minutes. Stir several times during this time. Cook on high 6 - 9 minutes until thick and 300 degrees (or cold water test - brittle threads). Stir in baking soda quickly and pour in foil lined pan. Let cool at least 1 hour or until firm. Can you give me the directions for microwaving this candy? Not sure how long to do it and do you have a thermometer that you put in the microwave? Sounds interesting and I'd like to try it this way. Thanks! I have never used molasses...always dark karo. The original post on here says molasses instead of karo syrup. Does molasses work better? Making honeycomb candy or angel food candy does take time for the temperature to rise. It's been years since I've made a hard cooked candy, but I think maybe you really need to generously butter your pan if you don't want it to stick when you pour it out to let it set. I think I'd be tempted to line the baking pan with buttered baking paper to make it even easier to remove and break up. I'm not sure if that would be better or not, but I'd give it a try. I just tried making these and it looked great until I tried to get it out of the pan. It was stuck like cement. I was only able to chisel away a little bit of it and just had to soak the rest of it in water. What I did try tasted good, stuck to my teeth a little. I did spray the 9 x 13 with Pam but what did I do wrong? I had my flame on medium and it took forever to get to 300-310. Is that normal? Thanks for anyone's help. I would love for these to come out better. Thank you. Now, that I'm ready to make it, can anyone tell me approx. how long it takes for the sugar to dissolve and then for it to reach 300-310? I never know if I'm waiting long enough. Also, can you use light corn syrup. Thanks!! This is generally made with white vinegar, but apple cider vinegar make work fine too. What do the rest of you use? I've seen the Angel Food Candy recipe on here a few times, but now that I'm ready to make it, I'm just wondering if you use white or cider vinegar or does it matter? Thank you!! I am pretty sure the room should be less humid because otherwise the candy compacts or gets sticky. I have also made this candy at home myself and I know that someone always told me the humidity level matters when making angel food. I was hoping to find here if you want the room more or less humid does anyone know the answer to this? It was really good. I also had ordered in the past from some other place I cannot recall, at about twice the price, only difference being more and higher quality milk chocolate. I will order from Seroogy's again - a WI company, too. Thanks for the link, I will check it out! For purchasing fantastic angel food candy, as well as many other kinds of candy, my hometown candy store, Wilmar Chocolates, is the BEST! They also have something called oysters that are out of this world and unique. I have not found them anywhere else in the country and we have lived in California, Minnesota and now Texas. I still order by mail from this store. I cannot be "home" for a visit without stopping in at Wilmar's. Any luck finding any on line sellers? I wish I knew the brand we had back home in Tomah....all I know is they sure don't sell it down south! I guess I need to go back home in the winter time to figure out what kind we used to get, if they still make it! My Dad used to buy me angel food from a candy store in La Crosse, but it wasn't anywhere near as good as what I can make, or we used to buy as kids. This stuff is AWESOME...love it love it love it. My mom also used to make something she called "Fondant". I remember she thought it was a hassle to make, but so good, possibly a cooked Fondant. They were chocolate dipped balls of powdered sugar similar to truffles. O so good. Too funny about the WI comment above. I too am from WI and am addicted to Angel Food. I used to buy it online from some place and cannot remember. Anyone have any good sellers of Angel Food, preferably with molasses in it? I never thought of those ideas that you mentioned! It is too good to go to waste! Thanks for the comments I have made about 4 or 5 batches and am steadily improving. Your right the secret is to not over mix once you add the baking soda. Don't Throw Away Your Candy! Don't throw away your candy that is left in crumbs. Put in a ziploc bag or an empty jam jar and save it to sprinkle on top of ice cream. You could also use the candy crumbs to roll other types of homemade candy in, like truffles, etc. Love this stuff, but too brittle? I have made this candy for YEARS and absolutely love it. My problem is that when I break it into pieces, it is like hitting a diamond at the wrong angle, it fractures all to heck and I end up with pieces way too small, thin and a bunch of crumbs. I would say about 1/4 of the pan ends up being thrown away.....does everyone have this issue? Sometimes it works great, other times I have a mess. Other than that problem, this stuff is GREAT! I like it WAY better than the candy store made stuff my Dad always sends me. We had this stuff growing up in Wisconsin and I have lived down south for most of my adult life and you definitely cannot find it down here, so I started making it! Yummy!